June 3, 1861: Skirmish at Philippi, followed by retreat to Beverly. July 7, 1861: Skirmish at Middle Fork bridge. July 11, 1861: Battle of Rich Mountain (Upshur Grays had 2 killed). Oct. 3, 1861: Skirmish at Greenbrier River. Virginia losses: 9 killed, 23 wounded, 10 captured. May 8, 1862: Battle of McDowell. 25th Virginia casualties: 86 killed or wounded. June 8, 1862: Battle of Cross Keys. Defeated Union forces under Gen. John C. Fremont. 25th Virginia casualties: 6 killed, 15 wounded. Virginia casualties: 4 killed, 5 wounded. June 25-July 1, 1862: Seven Days battles around Richmond, including Beaver Dam Creek, Gaines’ Mill, Malvern Hill. 25th Virginia casualties:unknown. Aug. 9, 1862: Battle of Cedar Mountain/Slaughter Mountain. 25th Virginia casualties: 1 killed, 28 wounded, 6 captured, 1 missing. Aug, 28, 1862: Battle of Groveton. 25th Virginia casualties: 4 wounded, 1 captured. Aug. 29, 1862: Battle of 2nd Manassas/2nd Bull Run. Defeated Union forces under Gen. Pope. 25th Virginia casualties: 5 killed, 15 wounded. Sept. 1, 1862: Skirmish at Chantilly/Ox Hill. 25th Virginia casualties: 7 wounded. Sept. 15, 1862: Battle at Harpers Ferry. Captured town with virtually no casualties. Sept. 17, 1862: Battle of Sharpsburg/Antietam. Bloodiest single day’s battle in Civil War. 25th Virginia casualties: 8 killed, 20 wounded, 6 captured, 1 missing. Hamilton’s Crossing. 25th Virginia casualties: 1 killed, 21 wounded. April 24, 1863: Skirmish at Beverly under command of Col. John D. Imboden. July 2-3, 1863: Battle of Gettysburg. 25th Virginia participated in assaults on Culp’s Hill. 25th Virginia casualties: 72 killed, wounded or captured. July 5, 1863: Skirmishes near Hagerstown. 25th Virginia casualties: 8 captured. July 13-14, 1863: Skirmishes near Potomac River. 25th Virginia casualties: 3 captured. Total losses in Pennsylvania invasion: 6 killed, 38 wounded, 21 wounded and taken prisoner; 26 captured, 1 missing in action. Nov. 27-28, 1863: Skirmishes at Payne’s Farm. 25th Virginia casualties: 1 killed, 8 wounded. May 5-18, 1864: Battles of The Wilderness and Spotsylvania. 25th Virginia casualties: 6 killed, 2 wounded (taken prisoner), 86 captured May 5; 1 killed, 4 wounded, 26 captured May 6; 1 killed (Colonel Higginbotham), 1 wounded, 17 captured; May 10; 1 wounded May 11; 1 killed, 2 wounded, 108 captured May 12; 12 captured May 15; 1 captured May 17; 1 killed May 18. June 1, 1864: Battle of Cold Harbor. 25th Virginia casualties: 2 wounded. July 9, 1864: Skirmish at Monocacy River. 25th Virginia casualties: 1 wounded, 1 captured. July 13, 1864: Retreat from Washington. 25th Virginia casualties: 1 captured. July 24, 1864: Skirmish near Winchester. 25th Virginia casualties: 3 wounded. Sept. 16, 1864: Skirmish near Winchester. 25th Virginia casualties: 4 captured. Sept. 22, 1864: Skirmish at Fisher’s Hill. 25th Virginia casualties: 1 wounded. Oct. 19, 1864: Battle of Cedar Creek. 25th Virginia casualties: unknown. Feb. 6, 1865; 1 killed, 2 wounded, 7 captured at Fort Stedman, March 25. 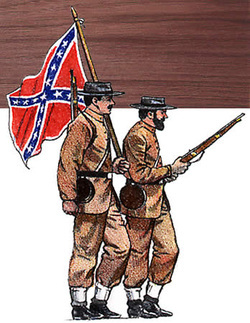 April 6-7, 1865: Paroled at Appomattox after the surrender were 15-20 survivors of the 25th Virginia Infantry.